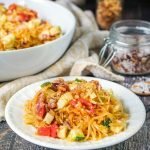 This low carb linguine salad is a versatile summer side dish that is perfect for picnics or even weeknight dinners. Add all the vegetables you want or even add a mixture of meats and cheeses. Only 5g net carbs per serving. Add cooked spaghetti squash and vegetables to a large bowl. In a small bowl mix everything else to make the dressing. Pour over the vegetables and mix well. Refrigerate for a few hours over over night so the flavors meld together.